This soup is packed full of gut healing, nutritional, fermented goodness. Miso is a traditional Japanese food that comes in a paste and is usually added to a stock to give it a rich, nourishing flavour. It’s made by fermenting soya beans with salt and a culture, and either rice or barley is added. 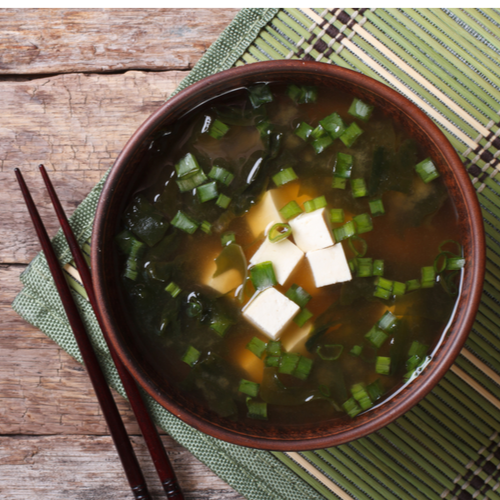 Miso is high in beneficial bacteria, protein and rich in vitamins. In addition, edible seaweeds such as Wakame and Nori are packed full of essential minerals such as iodine and iron. You can add any additional herbs or spices if you want. Place the bone broth in a large saucepan and bring it to the boil. Turn down the heat to low then add the seaweed and simmer gently for 5 minutes. Stir in the miso so it is fully dissolved, but don’t boil it. Add the spring onion and tofu, then gently heat through and serve. Sprinkle with chilli flakes if you want to add extra spice. Place all of the above into a pan and cover with cold water until a few centimetres above the contents. Bring to the boil and then reduce to a simmer for a minimum of 12 hrs chicken. The longer they cook for the better. You can alternatively put it all in a slow cooker on high for 12 hrs. Approximately every 20 minutes, skim off any foam that forms on top. Once done, strain off the bones and vegetables, it will keep in the fridge for 3 days or you can freeze it.